Bitcoin.com – the website behind one of the most successful Bitcoin wallet apps – recently began accepting Bitcoin Cash for its online gambling portal. After scraping its standard Bitcoin casino website and going back to more traditional forms of Bitcoin gambling, the site has now introduced a separate address for those looking to wager their Bitcoin Cash coins. Although still in its early stage, the adoption of Bitcoin Cash by online operators of Bitcoin casino games is slowly increasing. Bitcoin.com is the latest operator to introduce the newly created cryptocurrency to its website in an effort to provide its players with more convenience when it comes to depositing or withdrawing from the platform. According to an official press release from Bitcoin.com casino, the operator has chosen Bitcoin Cash for a number of practical reasons, including lower banking fees. Other advantages of using Bitcoin Cash outlined by the casino are faster transactions and payment confirmations as well as an increased number of possible transactions. The range of games available to Bitcoin Cash players at the website is the same as when you play with Bitcoin. Thus, you can enjoy a game of Video Poker with a 200 BCH Jackpot at the website but you can also have a go at its Slot, Blackjack, Roulette Craps, Keno, and Dice games. 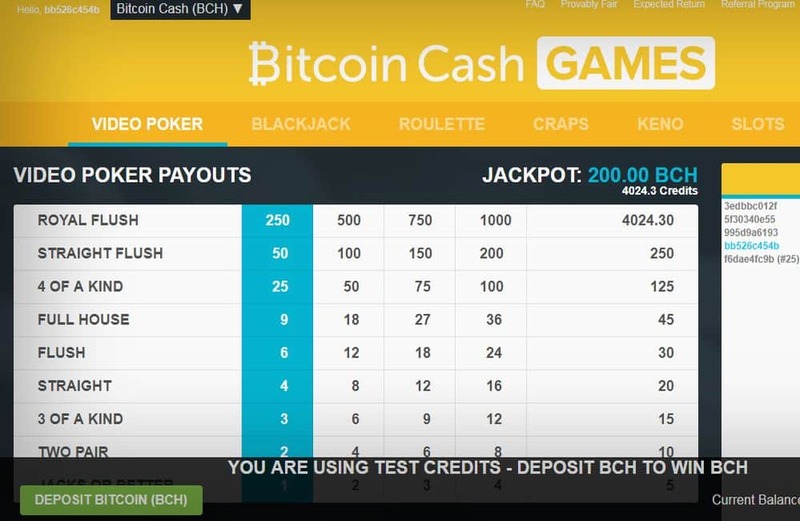 The most popular option seems to be the BCH Slots, which have been played by over 200,000 times thus far, followed by BCH Roulette, Dice, and Craps. Another adopter of Bitcoin Cash is mBit casino, which introduced BCH near the end of 2017. But unlike Bitcoin.com, mBit Casino incorporated the cryptocurrency along with Litecoin and Dogecoin, with plans to introduce Ethereum by the end of this month. Philip Aaker, CEO of mBit Casino, likewise cited lower transaction fees and faster payments as the main reason why the operator decided to introduce altcoins to their system. Bitcoin.com is a popular hub for Bitcoin supporters that not only offers a gaming platform but also an all-inclusive Bitcoin hub that comes with a wallet service, forum, and its own news platform. Back in 2015, the site’s owner was revealed to be Roger Ver – one of the strongest and earliest supporters of Bitcoin who was also nicknamed “Bitcoin Jesus” and is often called a “Bitcoin evangelist” as well. Although a passionate supporter of Bitcoin, in December 2017 Ver spoke to CNBC about turning his focus towards Bitcoin Cash which he believed to be faster and cheaper than Bitcoin. The site’s adoption of Bitcoin Cash is likely the result of Ver’s new-found approval of the offshoot cryptocurrency. Apart from the introduction of a new coin, the casino section of the website remains untouched. The site still offers provably fair games and a completely anonymous way of wagering your Bitcoin that requires no registration whatsoever, much like the old Satoshi Dice games. If you’re interested in browsing through the offer, you can use this link to visit Bitcoin.com casino. Alternatively, if you’re looking for a more diverse and modern gambling platform that takes both Bitcoin and Bitcoin Cash, feel free to check out mBit Casino instead.